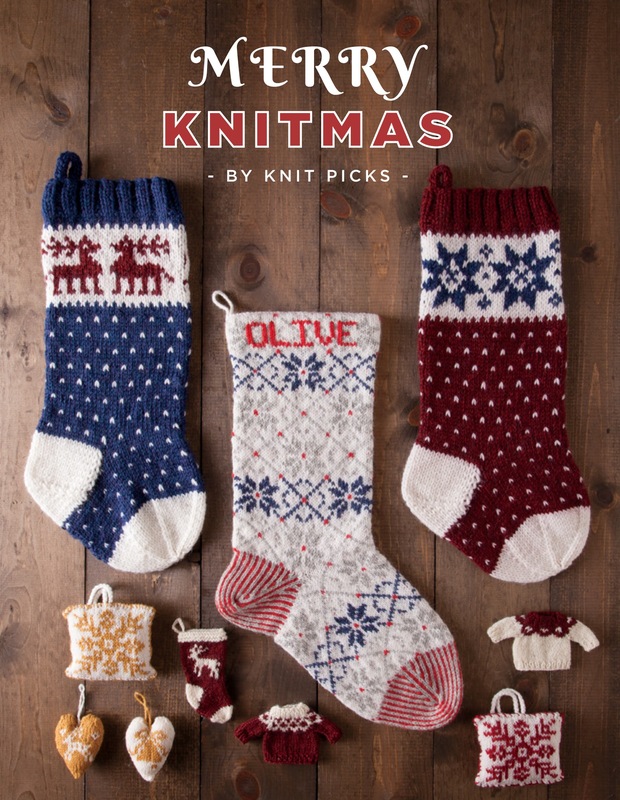 I have a pattern (or two, depending on how you look at it) in the new Knit Picks book, Merry Knitmas. Aren’t they sweet? 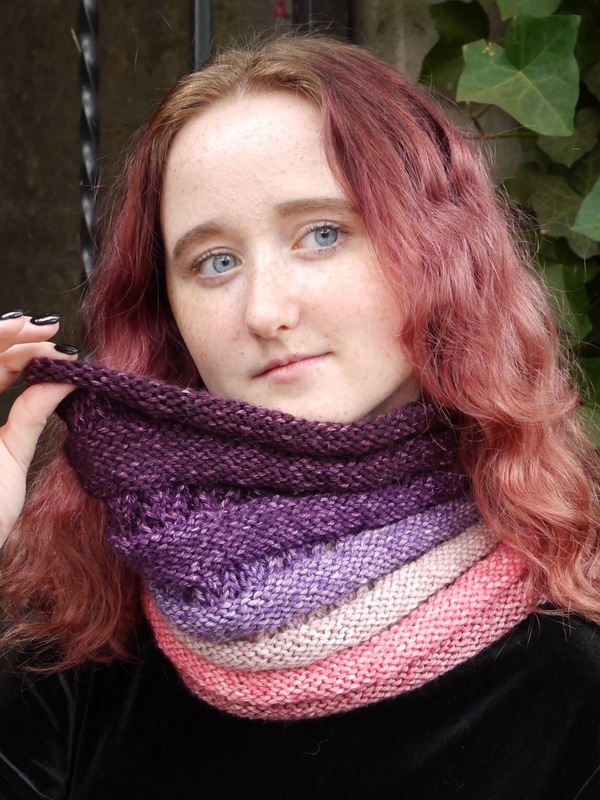 It’s a choose your own adventure pattern. 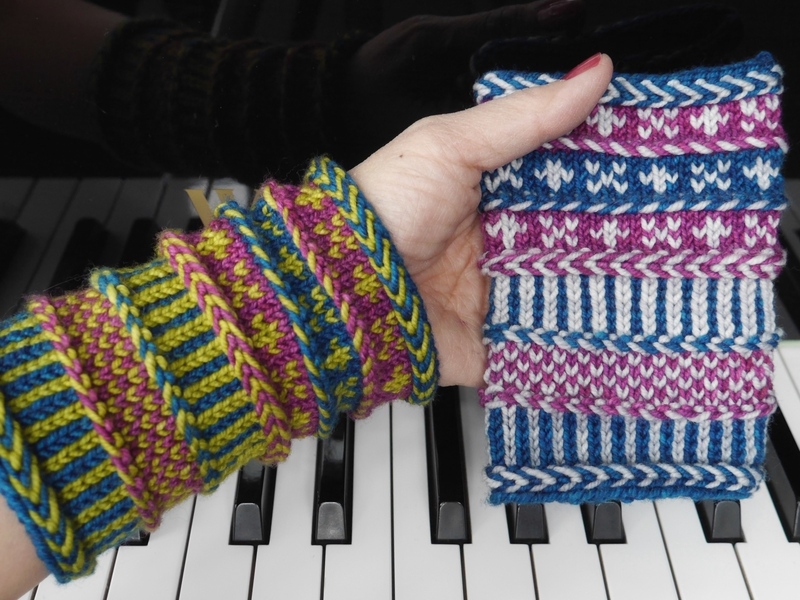 I wanted to offer a choice of cuff motifs that looked fairly traditional. 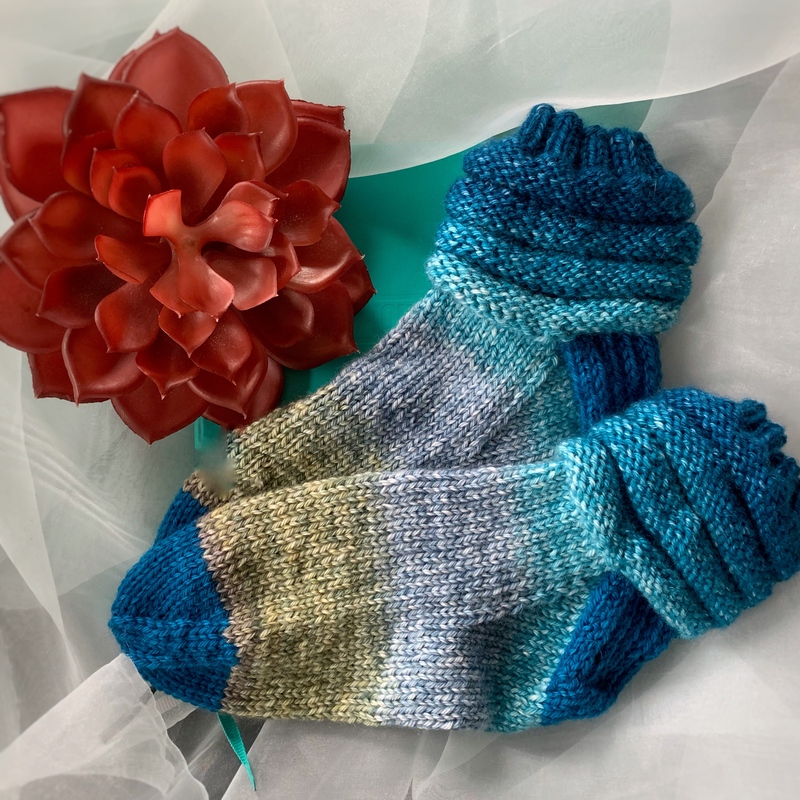 Three hanks of Wool of the Andes Superwash Bulky can be knit up into two coordinating stockings. I love how they styled these. Very homespun Americana. I love everything about these stockings. 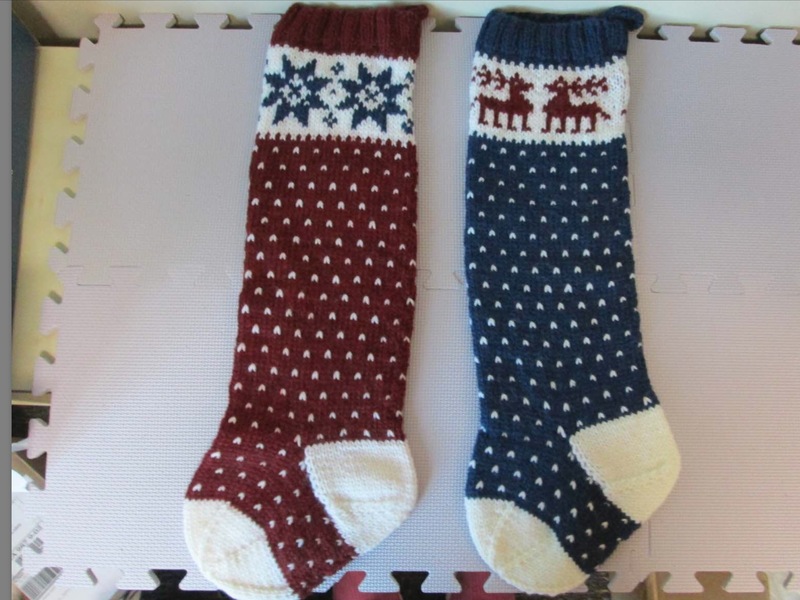 Christmas stockings are great first socks, because big yarn means that they knit up quickly. 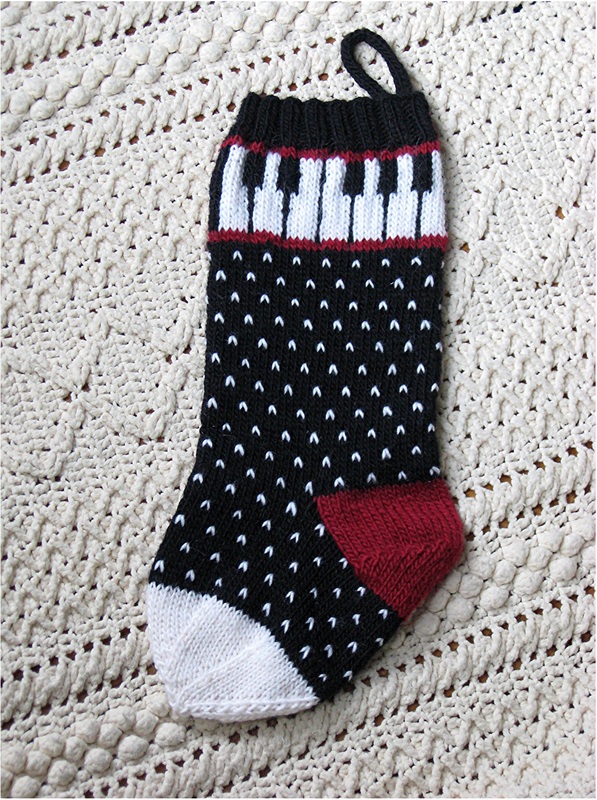 And you only have to knit one, so there’s no Second Sock Syndrome. 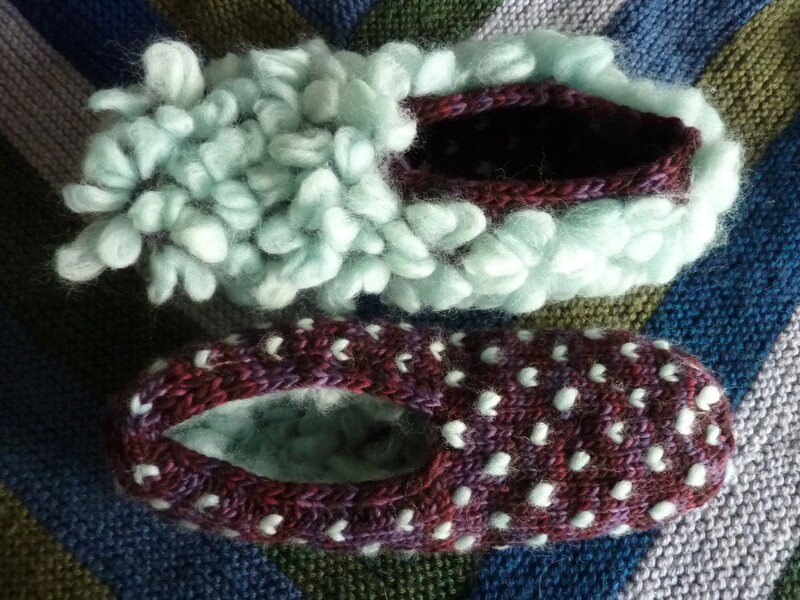 The stubby toe on the short leg makes me smile. 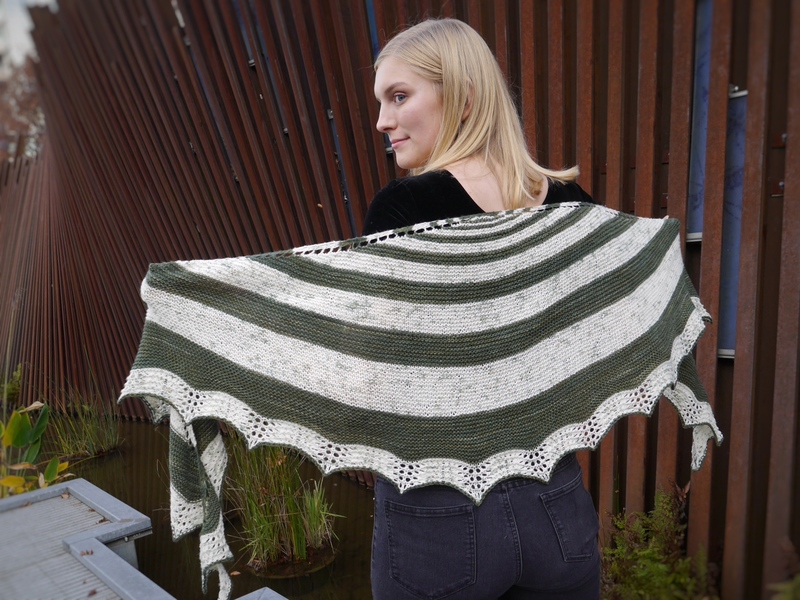 And you can’t even see where I snipped the yarn, frogged half the leg, and grafted it back together. 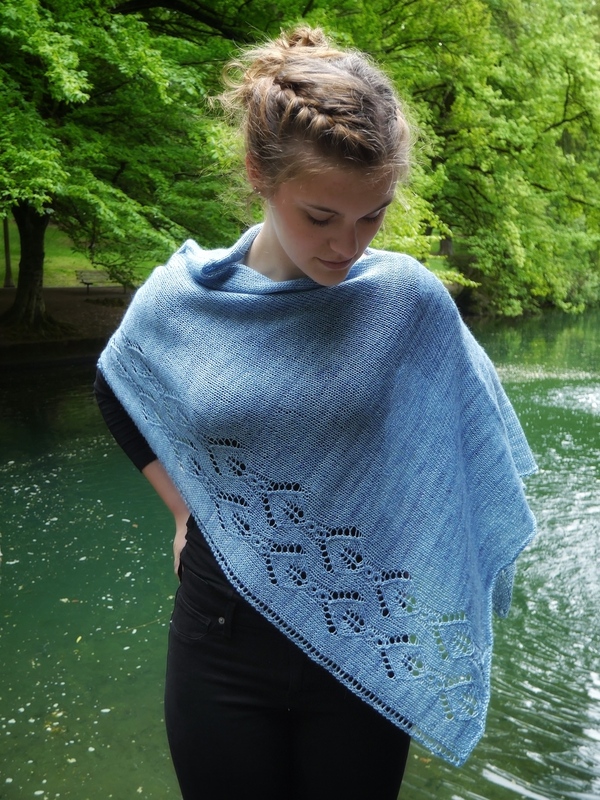 This is what they looked like when they came back from the test knitter, oops! I couldn’t show you yet when I posted about my grafting adventure this summer.) Not the proportions I intended. And look: They’re on the cover! 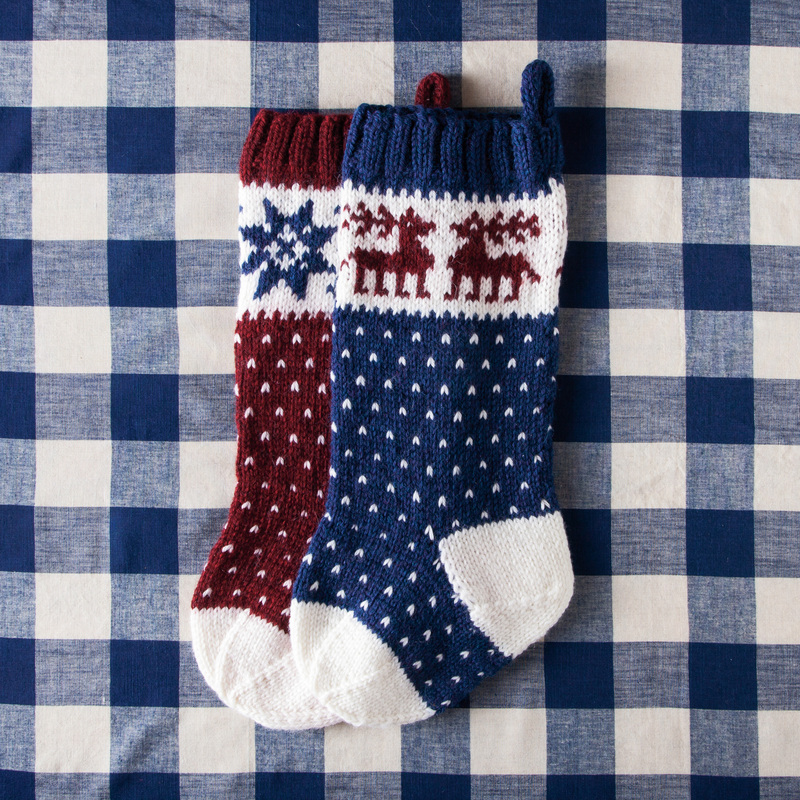 The Merry Knitmas Collection has patterns for these stockings and a lot more holiday home fun! 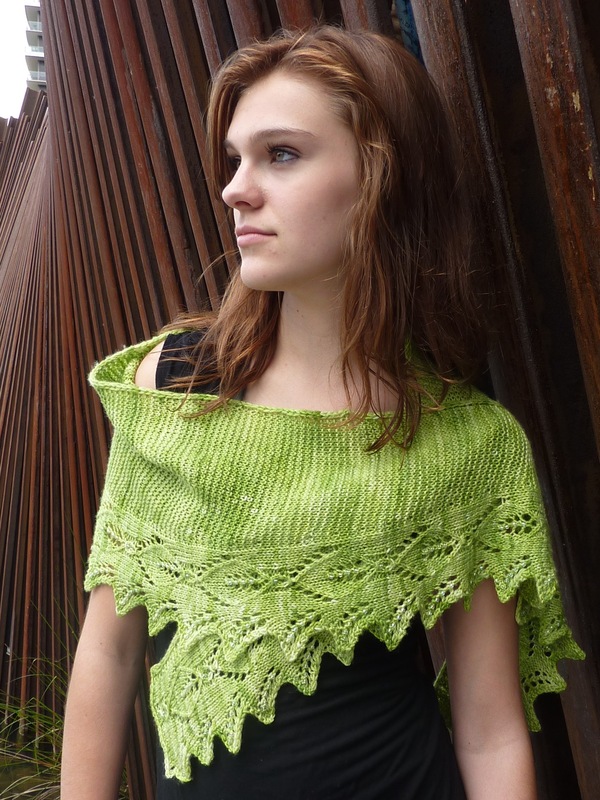 You can order it as a hard copy book, or as a pdf download from the Knit Picks site. 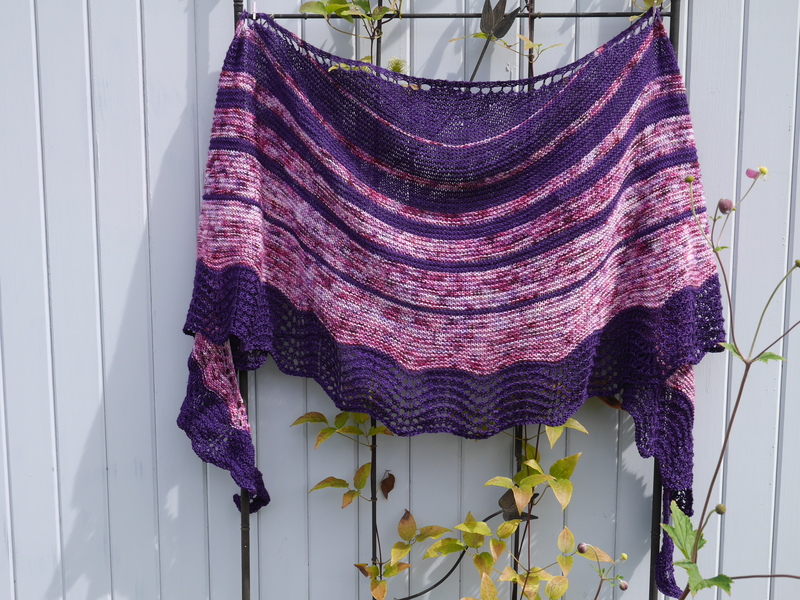 I’m having a little giveaway. 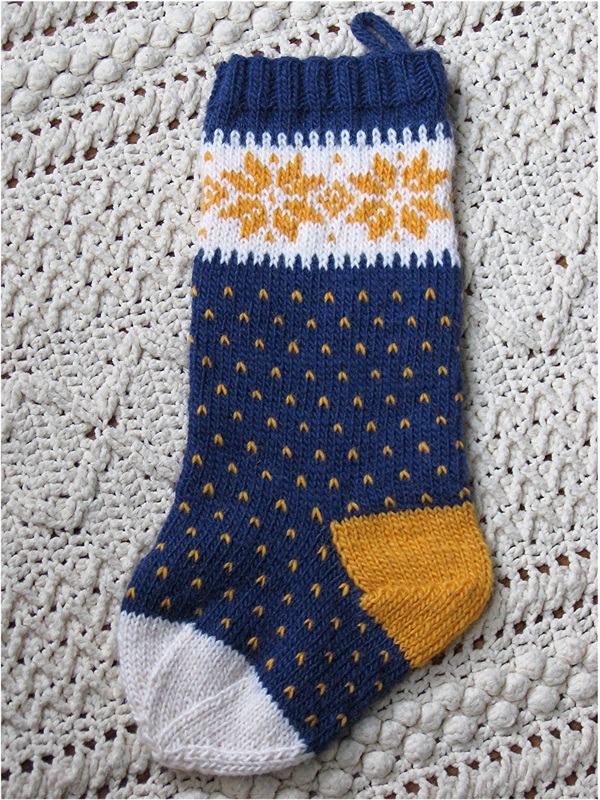 Leave a comment on this blog post and tell me who you want to knit these stockings for. 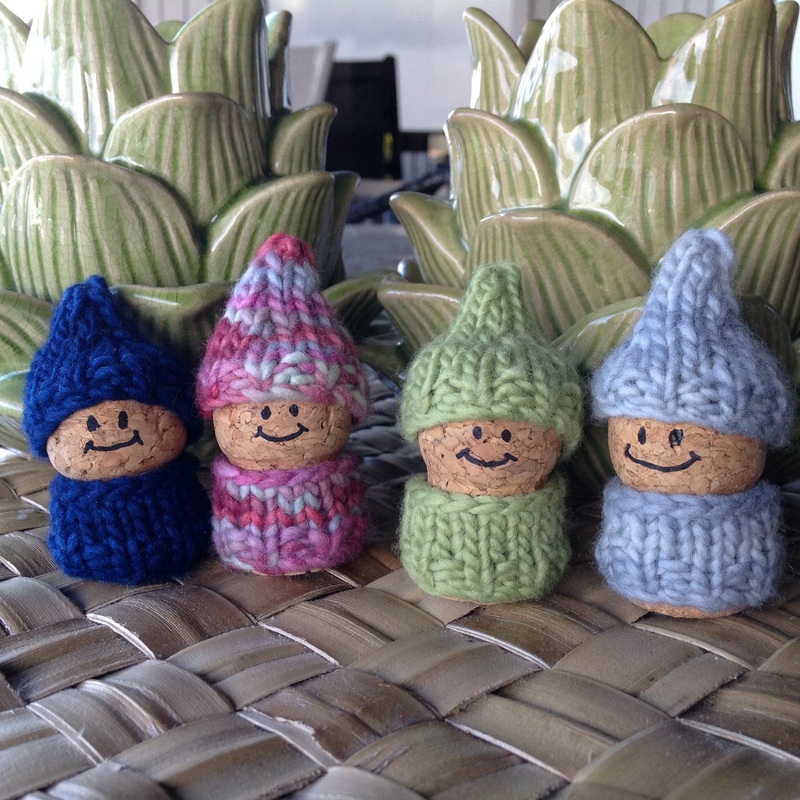 I’ll do a random drawing on October 18, and the winner will receive the Merry Knitmas e-book. Ready? Go! 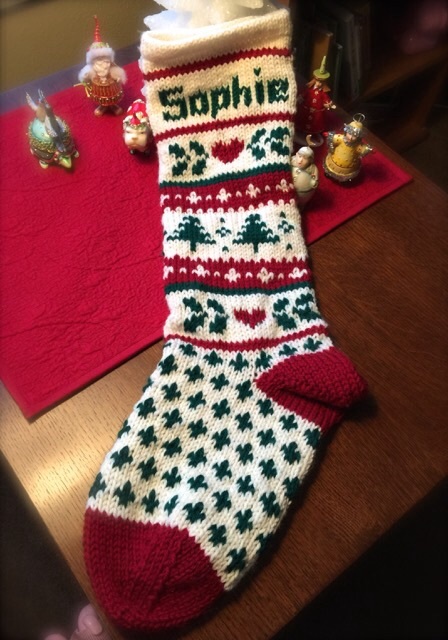 My last Christmas stocking made it home in time for the holiday. 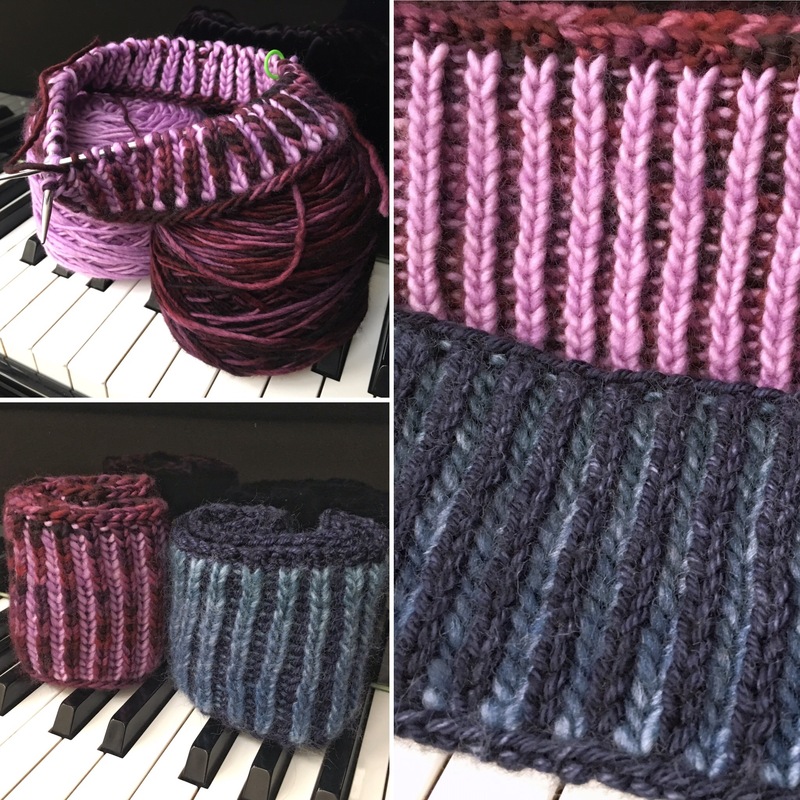 The red one is the Super Cabled Christmas Stocking in Knit Picks The Big Cozy. We started the day with the (adult) kids, serving up a mimosa brunch with waffle iron hash browns and brisket scrambled eggs (leftover brisket from Tuesday’s end of Hanukkah celebration). Prime rib is in the oven, and extended family is due at 5 p.m. Hope you’re having a peaceful day, whether or not you celebrate Christmas! 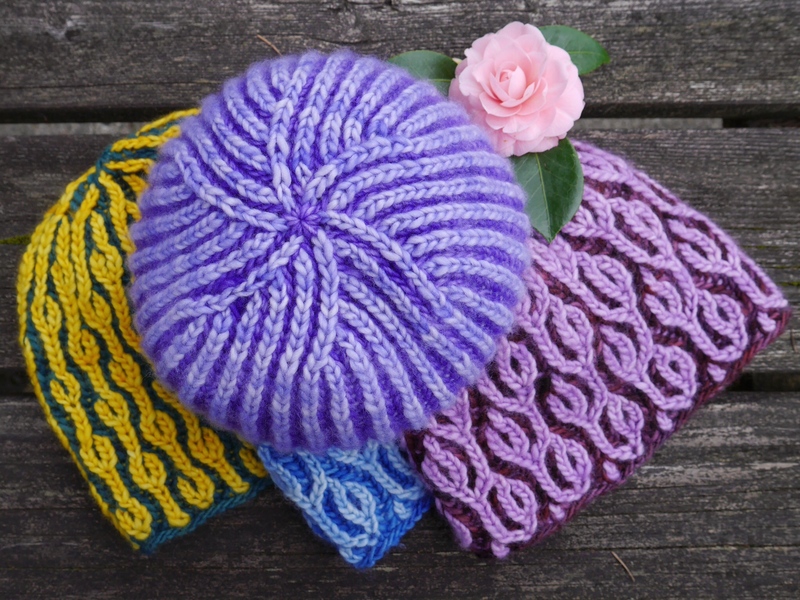 Did you receive any crafty gifts? My friend Carole gave me an Ott light, which will be very helpful for beadwork. It’s going to Crafty Moms weekend with me, for sure. 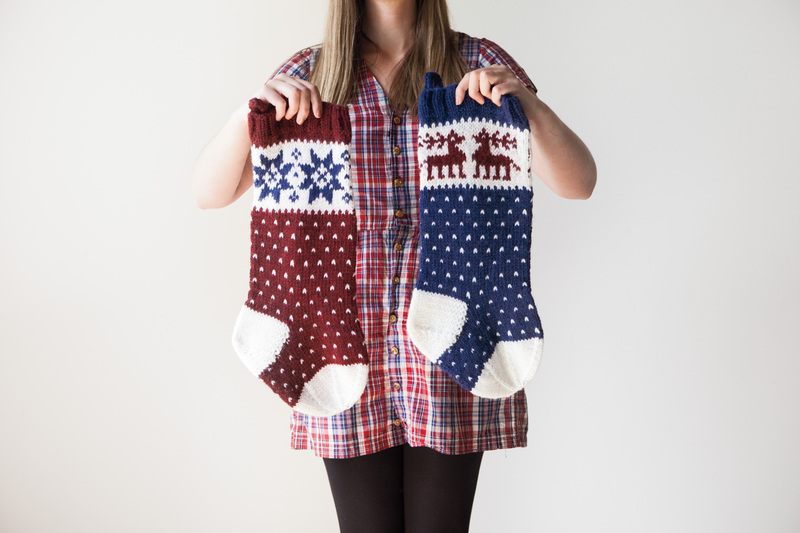 Thanks for sharing your Christmas stocking traditions with me! It sounds like many people use the Christmas stocking to hold off the main event gift opening until after coffee and mimosas civilize us. Very wise. 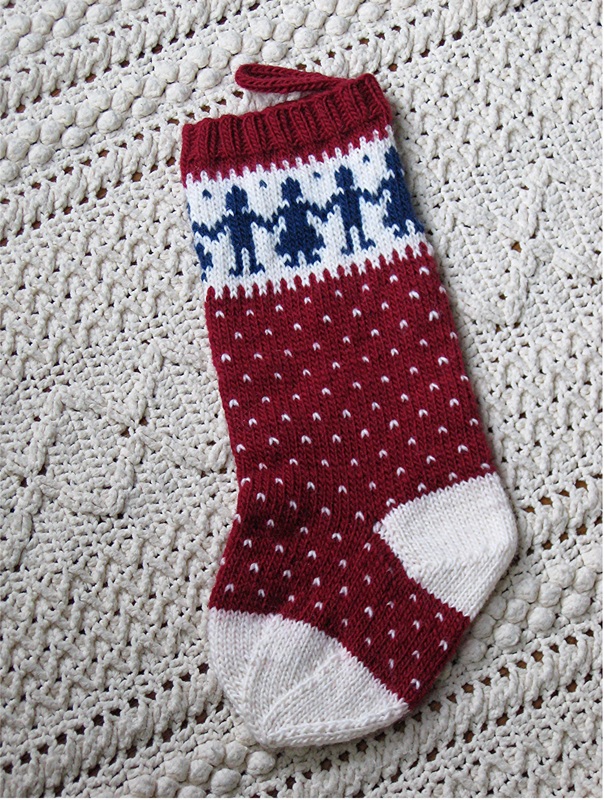 This is Anne‘s Christmas stocking that she knit for her granddaughter Sophie. Gorgeous! 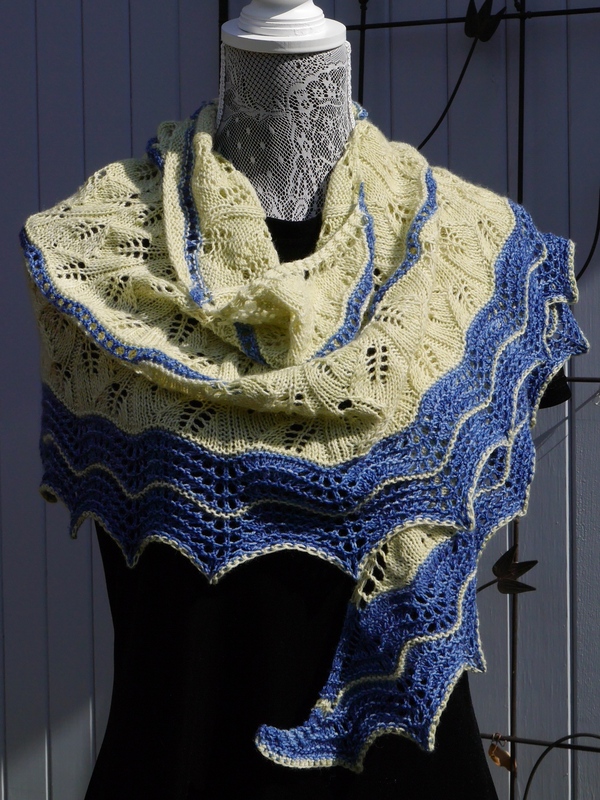 This is Sophie of Sophie’s Rose, the shawl Anne commissioned me to design in her honor. Thanks for sharing your picture, Anne! I forgot about my other set of Christmas stockings. 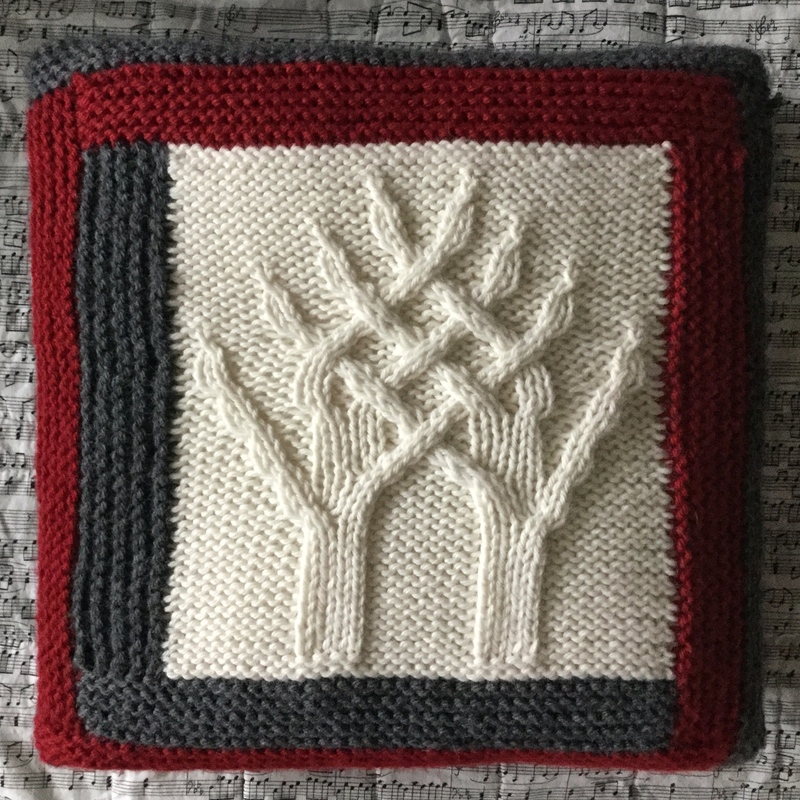 I wrote this pattern for a class I taught at church. 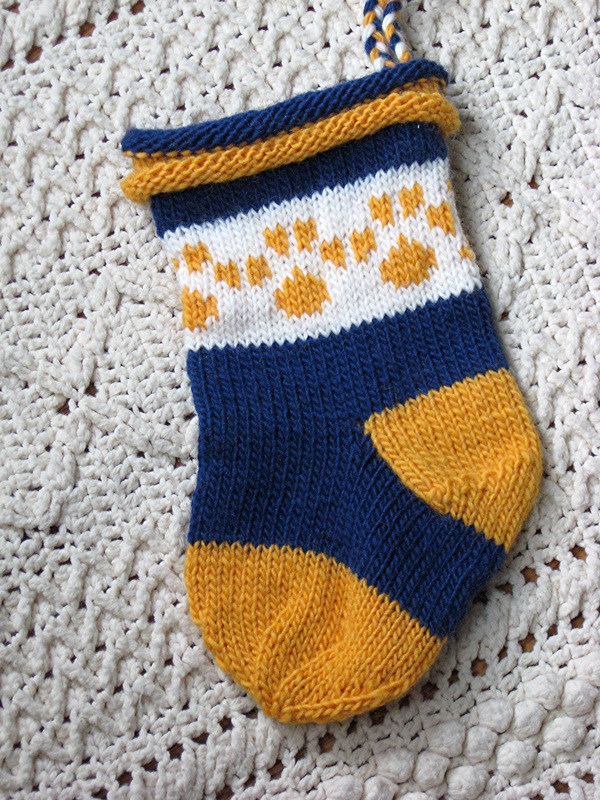 It’s a perfect tiny stocking, complete with heel turn. 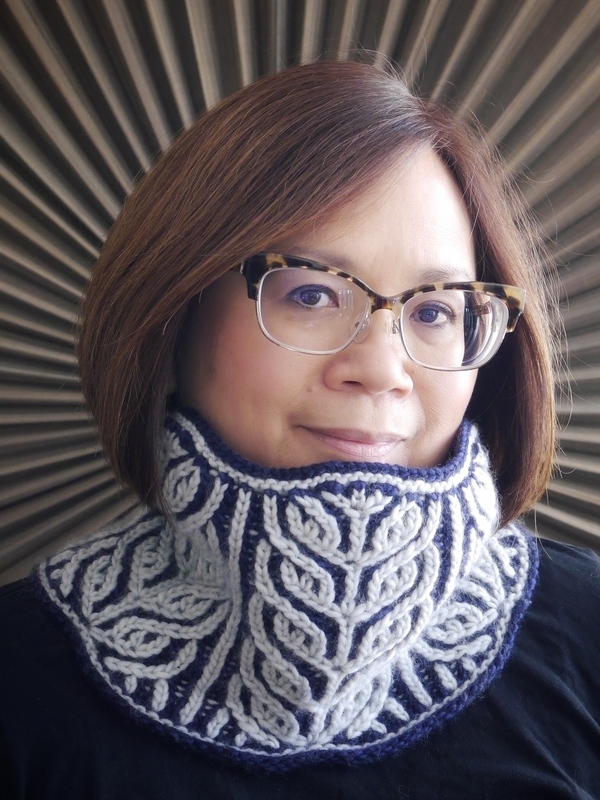 If you want to learn to knit a sock on dpns, this is a good learning tool. And you only have to make one. 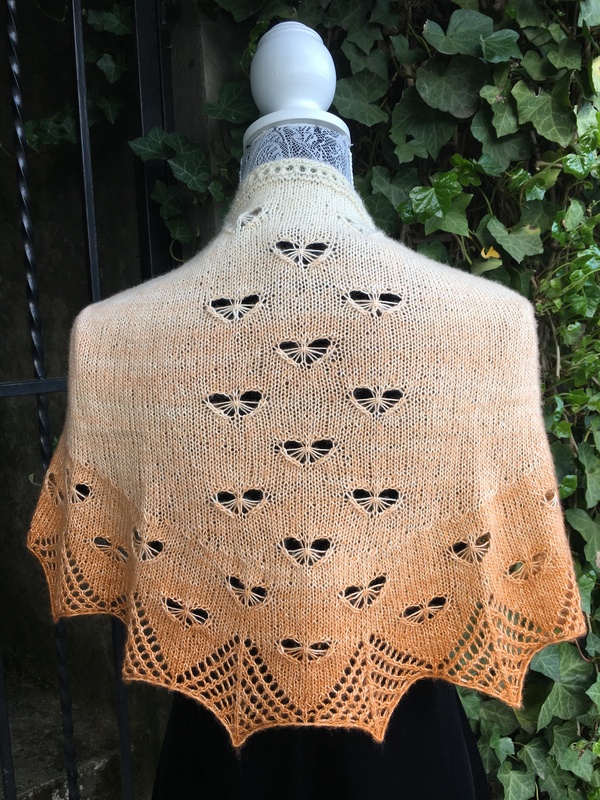 Speaking of cute and free, I’ve been making more of these. Are you ready for Christmas, those of you who celebrate? 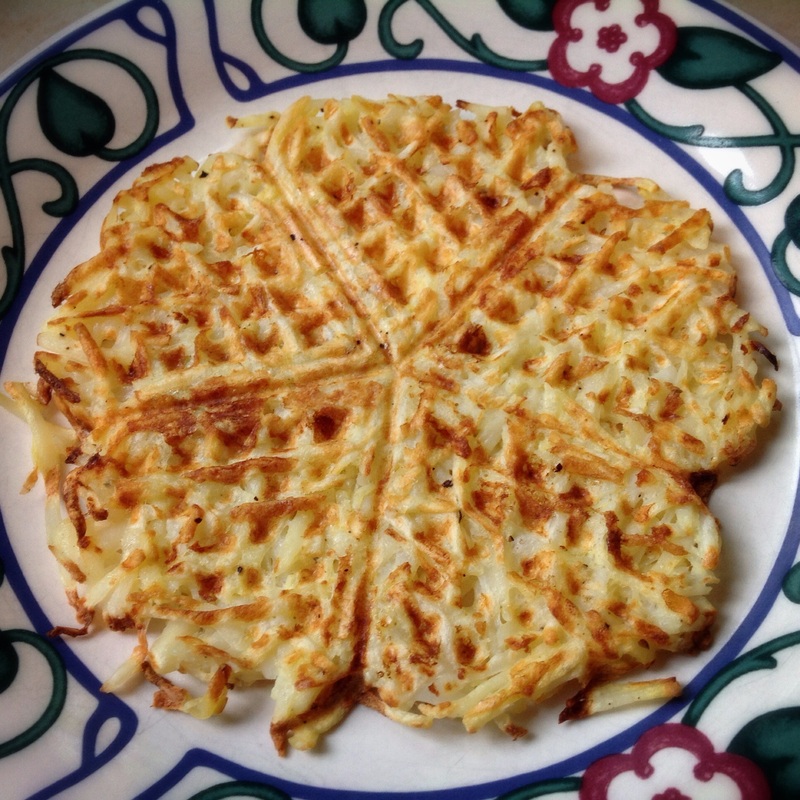 We’re also gearing up for our annual Hanukkah dinner party, which will be on Tuesday. We’ll be lighting ALL the candles. Happy merry GO! 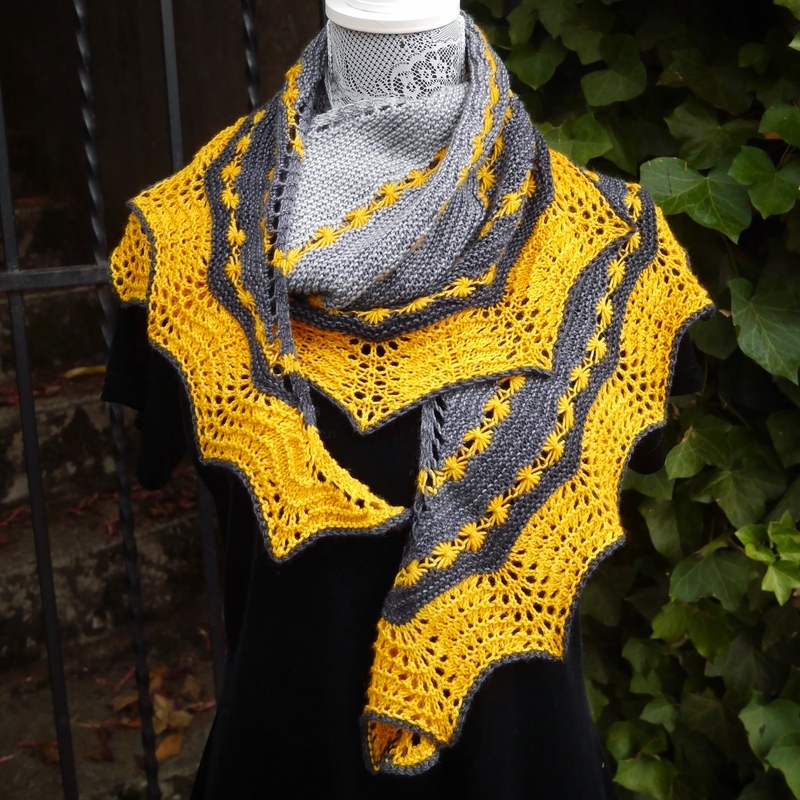 Does this look like the home of a knitter? 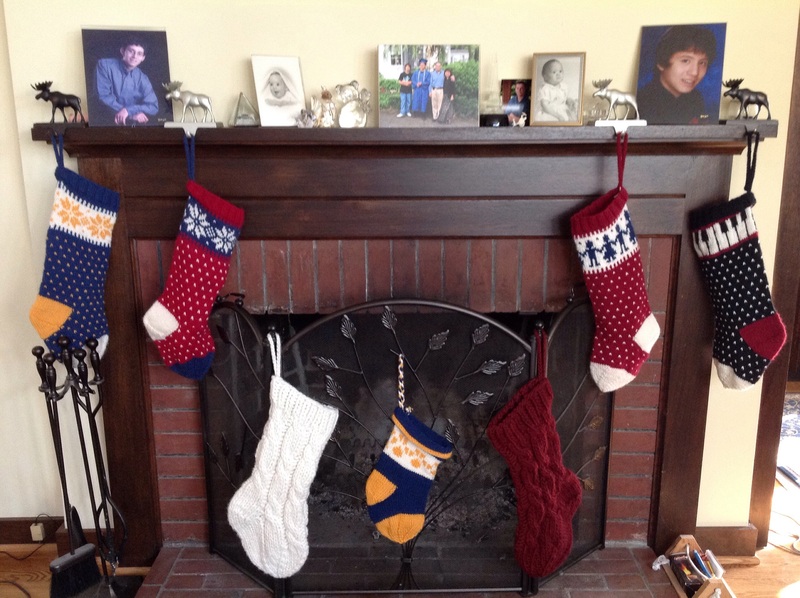 I knit Christmas stockings for our family about 15 years ago. 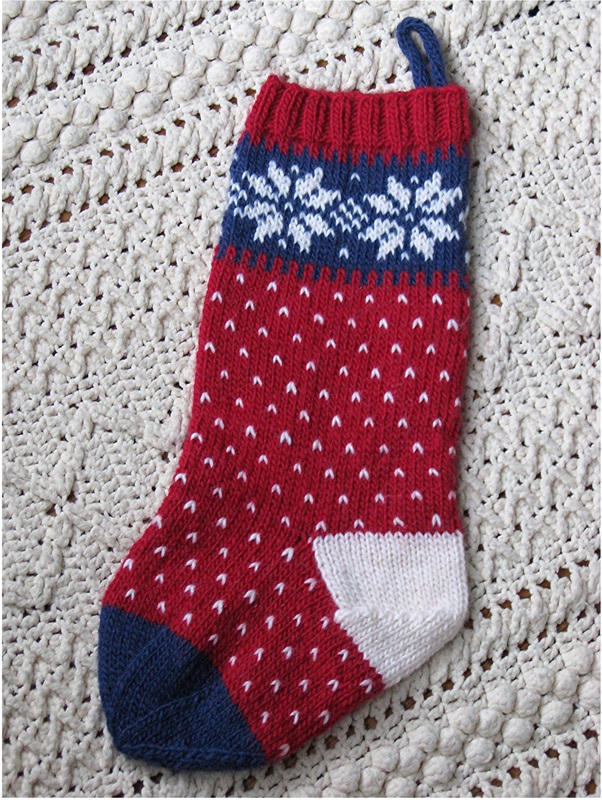 The snowflake stockings came first. My younger son wanted dancing people. Of course, we needed a stocking for the cat. 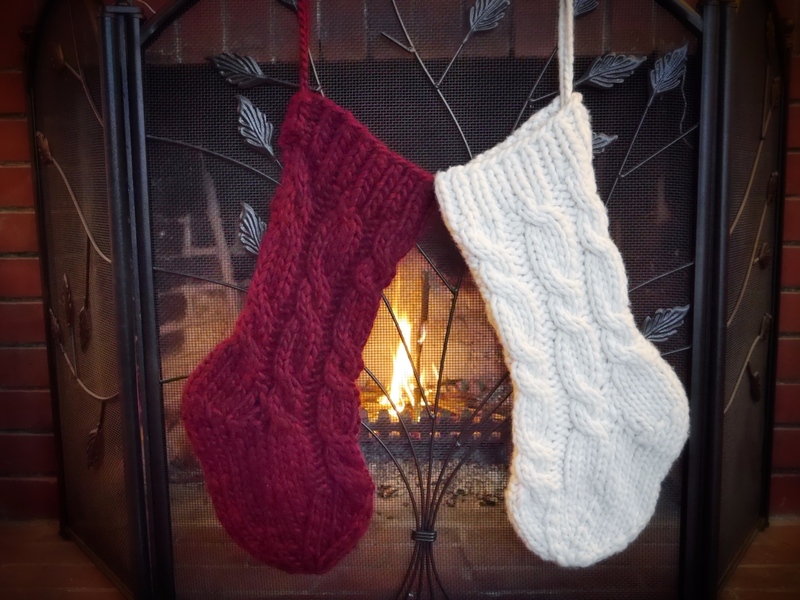 This year, I designed the super bulky Super Cabled Christmas Stocking. 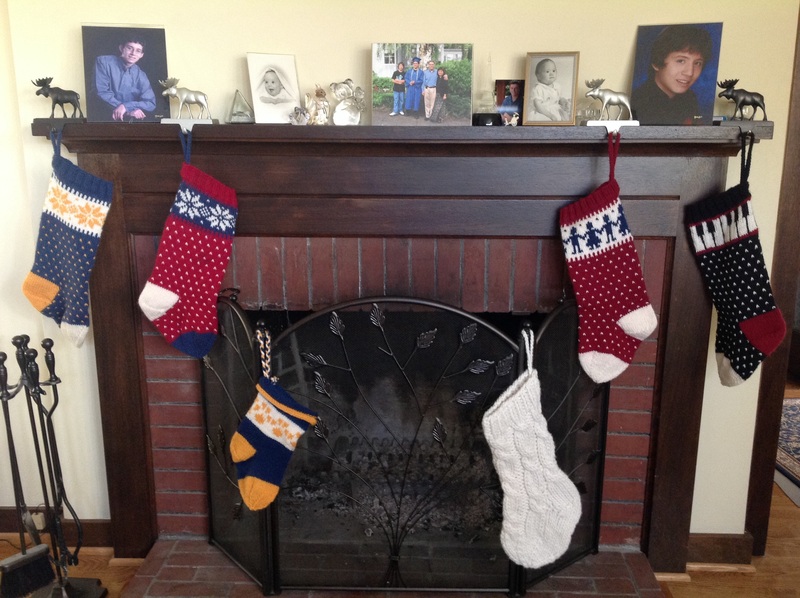 We’re not a family of six, even though our fireplace gives that impression! Our tradition is to open stocking gifts before Christmas breakfast. It was a way of holding off the wrapping paper frenzy until I was ready to face the day. It still works, even with grown kids! Now we add mimosas to that breakfast. 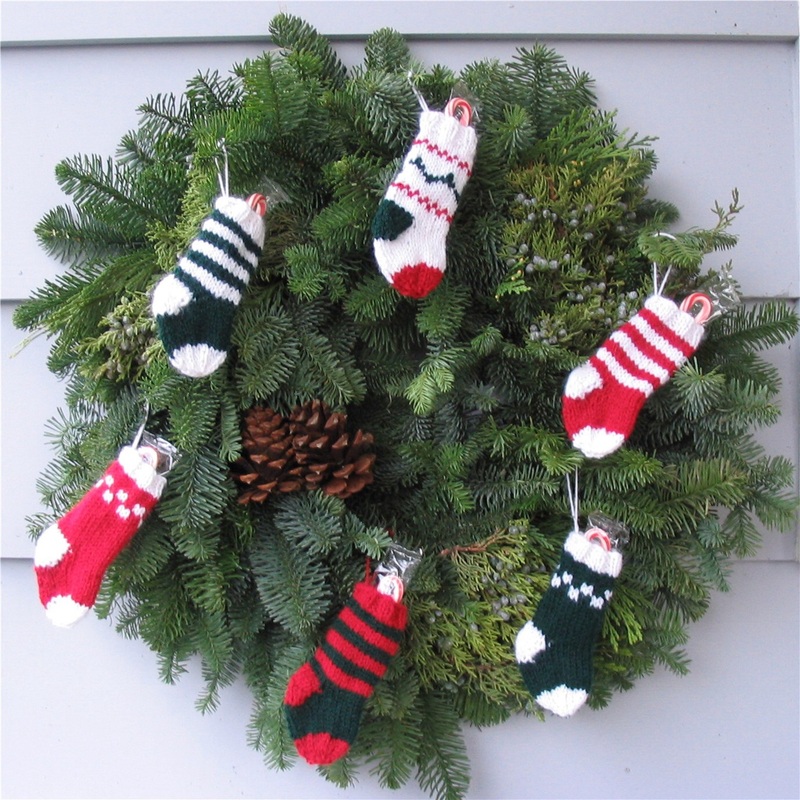 Do you have a Christmas stocking tradition at your house?